OsMA Divergence Indicator Generation III is modern MT4 indicator with complex mathematic algorithm (BJF Trading Group innovation). You will see divergenses on the chart and indicator. Arrows painted above/below the open bar and not in the past. You can see when actually you can trade. It is never to late! Signals based on closed bars so the arrows above/below open bar never disappear. OsMA (Moving Average of Oscillator, or Oscillator of Moving Average) is, in usually the distinction between the oscillator and the smoothing of oscillator. Then the signal line of MACD is used for smoothing and the basic line of MACD is used as an oscillator. If OsMA stops decreasing and starts increasing, it is the signal for buying. If OsMA indicator ceases increasing and starts decreasing its' the signal for sale. The discrepancy of the price and OsMA indicator is a trustworthy signal. 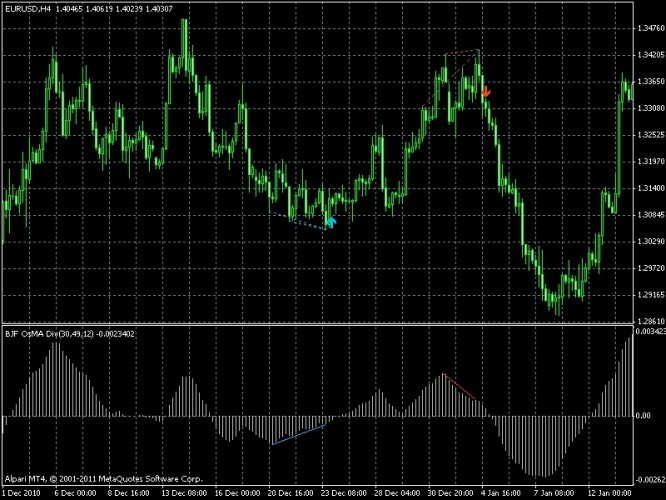 MT4 Indicator OsMA Divergence indicates fractal divergence by OsMA indicator.When divergence appears between OsMA and the price, it indicates a high probability that the current trend will finish soon. A signal to buy is when a new Low-fractal is formed below the previous one and a corresponding OsMA value is higher than the previous one. A signal to sell is when a new Up-fractal is formed above the previous one and a corresponding OsMA value is lower than the previous value. The indicator has a lot of customizable settings.